And How It Could Effect You?" Garage liability insurance is one area that most people never seriously consider when it comes to activities that take place in their garages. If your garage is a deluxe-man cave and you serve alcoholic beverages to your relatives or friends, you may want to consider the potential consequences. The same holds true for any commercial activity that takes place in your garage such as a Garage Sale. Case law is littered with successful claims from friends, neighbors, relatives, and even strangers that have been injured in a residential garage being used for commercial activity. In most cases the defendant was under-insured for the amount of the claim. The crux of the matter comes down to the nature of the activity and how it can effect your personal liability. We want you to be armed with the necessary knowledge to protect yourself, your family, and your property. So lets delve into the nature of these liability issues and the nexus that connects you to the liability of even a third-party claimant. You have just finished your man-cave complete with a small kitchen, plenty of refrigeration for the booze, a huge Hi-Def flat screen with Surround Sound. The guys are coming over on Sunday for the big game. Da Bears are playing Green Bay — and its going to be the game of the decade. The beer flows throughout the game and cousin Louie is flat-out skunked. His favorite team is losing and he bet way too much with Charlie the bookie. He is going to drink his loss away — for tonight anyway! Too bad you didn't check into that garage liability insurance the guys at the office talked about last Thursday. The guys clear out about 8:30 p.m. after the stunning loss and cousin Louie heads for home to sleep-off his drunken grog. On his way he runs the red-light at 16th and MLK Boulevard hitting an SUV filled with teenagers. The driver of the SUV is DOA at Mercy Medical Center. Cousin Louie starts to sober up a little and wonders about his own insurance coverage, in light of the situation. About two months later a county sheriff Deputy is at your door serving you with civil-litigation papers. You are being sued by the family of the dead teenage driver. Cousin Louie is in the county lock-up and has been charged with Motor Vehicle Homicide. You are being sued for gross negligence leading to the wrongful death of the teenage driver because you let cousin Louie leave in his car skunk-faced drunk and you provided the booze. Nothing to really worry about for you though! Your homeowners insurance policy covers your exposure under the liability clause and they are providing the attorney to defend you. About three months later you get notice from the Clerk of Courts in your case that your insurance company has settled with the family of the teenage driver for the limits of your insurance policy coverage and you will need to retain new counsel to represent you for the remainder of the case. Outrageous you exclaim! What just happened here? Well, you were under-insured! Too bad you didn't check into that garage liability insurance the guys at the office talked about. The case is going to trial before a jury. Your insurance liability limit in your policy is for $100,000.00. The attorney for your insurance company has estimated that the jury award will be in excess of $2,000,000.00 due to the fact that the standard of proof of your gross negligence is very low in a civil case. He recommended to your insurance company that they pay the limit of the policy and get out of the case — leaving you high and dry. You will now likely loose everything ending in bankruptcy! 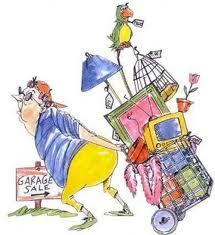 Your wife Sharon has been holding garage sales twice per month on the weekends to make a little extra cash. She has been fairly successful and has a real knack for buying cheap at the junk-stores across town and re-selling at a profit in your suburban paradise. Too bad you didn't check into that garage liability insurance the guys at the office talked about. She has about 300 to 400 visitors on sale weekends and is considering this as a full-time business. What you both don't know is that — she is already conducting a commercial business. The word Sale in her front yard sign is the nexus that connects her to the world of commerce and all of its deep and dark hazards. Its the world of Admiralty Law which you know nothing of — because you live on dry land — right? Wrong ! ! ! Marcy, the old garage sale Lady from down the street just injured her 73 year old back hauling her stash away from the sale. Unfortunately, she was still on the property in question when the injury occurred. To make things worse, she was using a defective cart that Sharon loaned her to get her haul home, a block away. Her grandson Eli is an attorney, and he got to the scene of the crime within two-hours after the incident took place. Eli carefully photographed the Garage Sale sign from many angles showing your garage within the shot with the tables full of items set up and for sale. No question about it in Eli's mind — Sharon and her husband are definitely operating outside the common law of England and are subject to Admiralty Law with their private sale. Eli announces he will be preparing suit for Grandma Marcy's injuries caused by your faulty cart. You begin to wonder about your insurance coverage. The key in this case scenario is the word sale. It is a commercial term and no commoner should be involved in commerce, according to the Bible anyway. The fact that the injury occurred on the same property as the sale as an incident to it, makes the case in Eli's mind. He is wondering how much garage liability insurance coverage you have? Both of the above scenarios have happened in North America thousands of times. Don't let them happen to you! Garage liability insurance is an area that you need to investigate when you conduct your Insurance Audit mentioned on our Garage Insurance page. Make sure you have sufficient coverage to keep you from a devastating loss depending upon the activity you are involved in on your property. The most casual of incidents can turn into a monster claim against you and your property. Don't underestimate your potential liability in these situations. If you, or your insurance agent do not understand your exposure then we recommend that you seek legal counsel from a attorney litigator experienced in insurance claim cases. He/She can explain to you in detail the nature of your liability exposure and help you determine how much garage liability insurance coverage you need.